Hex Colour Code Chart Generator. Are you looking for a nice easy to use colour chart to generate your own colours and get the hex colour code to use on your website. Its easy to use select the colour of your choice then drag the pointer to the exact shade you want and you will see the hex code numbers changing until you stop moving the pointer at the desired colour. Then copy the hex code and you will have the hex code for the colour to paste to your site. The hex colour chart will generate the exact colour of your choice making it easy to change your page background, menu or any colour on your site by inserting the hex code into your HTML. Sometimes you might want to select one colour as the main background colour of your site then use other colours that match that colour for menu backgrounds, text links, borders etc. this can take up quite a bit of your time to get the look right. We have the solution and it will take you a few seconds. Once you have selected your main colour from the colour chart use our colour wheel to paste the hex code in and it will generate 4 matching colours with the hex colour codes making it easy for you to design a site with all the colours matching. 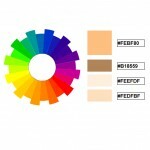 The colour wheel also has its own selection of ideal colours for your site, click anywhere on the wheel and it will automatically generate 4 matching colours. It will display the matching colours so you can see them and also give you the hex code for each of the colours. If they are the colours you want copy the hex code and paste onto your site easy as that. When you create your own website there are lots of different things to consider and the look is one of them, it might not be as important as your SEO as it will not bring you more visitors but it is important for your site to look good. Remember a picture paints a thousand words. When a visitor arrives on your site you do not want to chase them away with your colour scheme. Its a good idea to visit some other sites with the same category as your site to get ideas of colours to use. Once you have decided then use the hex colour code generator to generate similar colours from there select 4 colours that match your main colour and design your site.